1 Combine Hellmann’s® or Best Foods® REAL Ketchup, olive oil, ginger, garlic and lime juice in small bowl. 2 Toss chicken and mango with 3 Tbsp. Ketchup mixture. Alternately skewer on wooden skewers. 3 Oil grill rack. 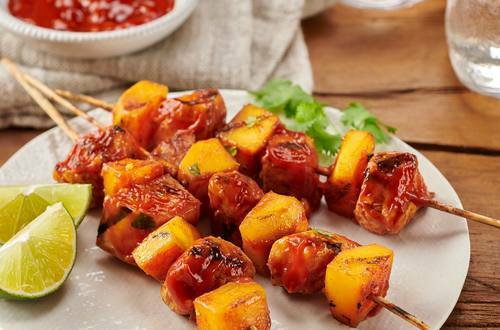 Grill skewers, turning occasionally, until mango is lightly charred and chicken is thoroughly cooked, about 8 minutes. Brush generously with some of the remaining Ketchup mixture and grill 1 minute more to glaze. 4 Arrange on platter and serve with remaining Ketchup mixture for dipping. Garnish with cilantro and lime wedges. Tip: Also delicious with shrimp instead of chicken!